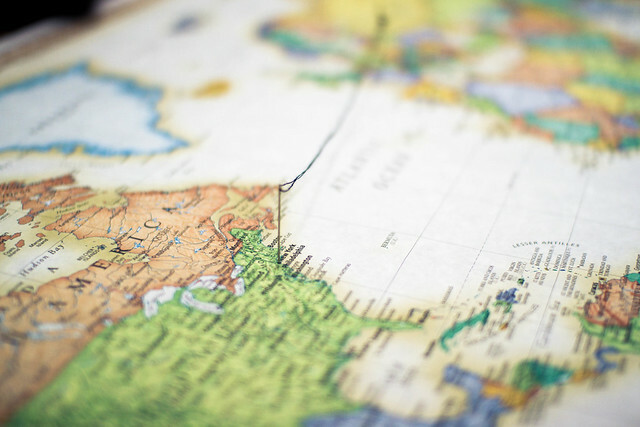 What’s more isolating—environmental distance or … plain old distance? We molecular ecologists spend a lot of time thinking about how we can differentiate the effects of natural selection acting on populations in different environments—local adaptation—from the simple isolating effects of, well, being in different places—isolation-by-distance. There’s a considerable literature of studies using genetic data to try and make that differentiation, and the very first paper of 2014 in the journal Evolution was a review that tries to extract some broad trends from that literature. Jason Sexton, Sandra Hangartner, and Ary Hoffman searched Google Scholar and the Web of Science for papers estimating gene flow rates with respect to geography and environmental variation. They filtered the results list to include only field studies on natural populations outside hybrid zones, using neutral genetic markers to estimate gene flow—which left 110 papers that were relevant for the question of how locally variable selection interacts with gene flow. Figure 1 from Sexton et al. (2014). So there’s a non-surprising result that is nevertheless nice to see: studies of plants were less likely to find evidence for population structuring due solely to local adaptation, compared to studies of things that are (at least nominally) more mobile. It’s somewhat surprising to me that, overall, almost as many studies found pure IBE as found a mix of IBD and IBE—but that may be due to the exclusion of hybrid-zone studies, which are explicitly about that interplay. The authors also compared FST estimates from studies in these different categories—but don’t find much significant difference. Studies finding only IBD had a mean ± SE FST estimate of 0.090 ± 0.039; those finding IBE and IBD had 0.098 ± 0.026; and those finding IBE only had 0.077 ± 0.017. That’s lumping together estimates based on a bunch of different kinds of markers, from allozymes to microsatellites to SNPs, which seems to me like it might introduce a lot of noise. The authors don’t compare FST estimates based on different marker types—though they do split out studies using microsatellites and find that the IBD/IBE breakdown looks about the same as the overall data set. I’m a bit disappointed the authors didn’t go farther, and do a more formal meta-analysis. A paper published last year in Ecology Letters (which Sexton et al. cite) did take that approach, and finds a non-zero effect of IBE independent of IBD. 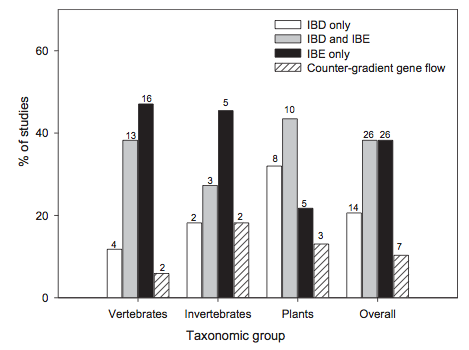 That study, by Aaron Shaver and Jochen Wolf, doesn’t do the same sort of taxonomic breakdown that Sexon et al. did, but they do make a comparison between effects estimated in studies using different markers—and, somewhat encouragingly, found that marker types (mostly) don’t make a difference. Sexton JP, SB Hangartner, and AA Hoffmann. 2014. Genetic isolation by environment or distance: Which pattern of gene flow is most common? Evolution. 62(1):1-15. doi: 10.1111/evo.12258. This entry was posted in adaptation, population genetics. Bookmark the permalink.